On a recent trip through the San Diego Airport, I was surprised to see a dog wheeling around the airport. He was dressed for the holidays wearing a Santa hat, elf collar and a vest that read, ‘Pet me’ in big bold letters. People surrounded him like presents around a Christmas tree. Young and old, travelers, airport staff, pilots and crew all stopped to pet the adorable ball of fur. When the crowds parted, I got my chance to meet this wonderful canine ambassador. 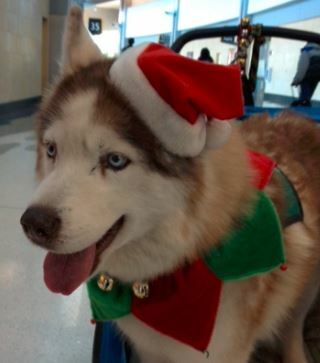 Champion Brother Bear is a 12 year old Siberian Husky who lives with 7 other huskies in California. His nickname is Koda. He takes turns with the other dogs coming to the airport to de-stress the travelers. Research conducted by Dr. Karen Allen verified what pet people already know – spending time with animals lowers our blood pressure and heart rate. People who live with pets also get more exercise, visit their physicians few times each year and have lower levels of cholesterol and triglycerides. I hope more airports will follow the San Diego Airport’s lead and embrace animal assisted therapy! Sources: -Allen, K., Shykoff, B. E., Izzo, Jr. J. L. Hypertension, 2001;38:815-820. -Friedmann, E. et al, Social Interaction & Blood Pressure: Influence of Animal Companions. J of Nervous and Mental Disease 17 (8): 461-465. -Seigel J.M., Stressful Life Events and Use of Physician Services Among the Elderly: The Moderating Role of Pet Ownership. J. Person Soc Psych 1990; 1081-1086. -Serpell, J.A. Evidence for long term effects of pet ownership on human health, Pets, Benefits and Practice, Waltham Symposium 20, April 19, 1990.